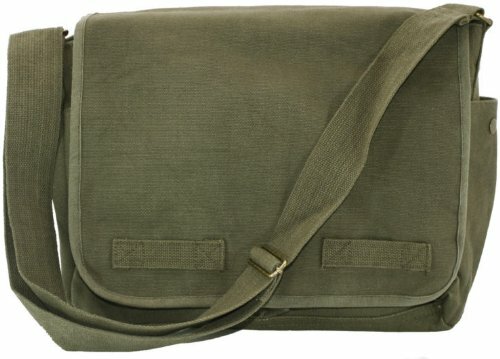 Olive Green Original Heavyweight Classic Military Messenger Bag with Army Universe Pin - You simply can't go wrong with such a great bag! This bag is heavy duty and durable and its something you know you can rely on regardless of the circumstances. The classic messenger bag offers a very basic, clean and simple design in a single color and is sure to never to stand out. It was good enough for a famous guy named jack who had to save the world many times and even came back from the dead, hence the nickname jack bag and 24 bag. This bag is worn by women and men but is only suitable for adults. Makes a great bag for cyclists, couriers, deliveries, school, college, baby gear on the go and much more! Each bag comes with an official Army Universe logo pin. HEAVYWEIGHT. Made from heavy duty cotton canvas which is a durable material that will not rip easily and is sure to last. Heavy duty double stitching all around. ROOMY. 6 total pockets. Super roomy and large main compartment that is open and offers easy access. Two large side pockets - one pocket on each side, with snap closure (great for bottles, umbrellas, pens, shirts and more!). Two pockets under flap that are open and offer easy access. One zippered pouch in the main compartment. STRONG AND DURABLE. Bag flap closes with a hook and loop closure. Bag has an adjustable shoulder strap that is 40" long x 2" wide. Strap is not removable. CLASSIC DESIGN. This messenger bag is great for college students, school, basic traveling, every day bag and is a large bag suitable for adults. Unisex. Messenger bag that is not structured and does not offer padding or structural support. Dimensions: 15" x 11" x 6". Easily fits all Apple Macbook Pro and Air, Ultrabooks, Notebook PCs, Laptop Computers, Netbooks - 10, 11, 11.6, 12, 13, 13.3, 14, 14.7, 15, 15.4, 15.6 inches. Comes with official Army Universe Pin. If you have any questions about this product by Army Universe, contact us by completing and submitting the form below. If you are looking for a specif part number, please include it with your message.